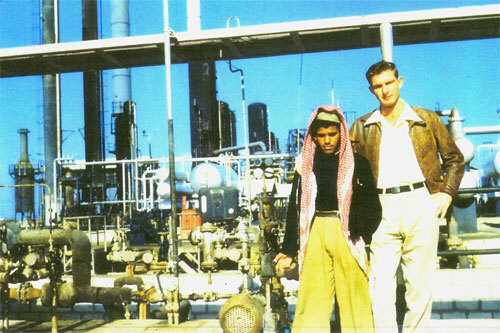 For the first time I was all alone the next day, Thursday, June 7, 1951, as Oran went back to work in the Refinery. He was on day shift from 7 a.m. until 3 p.m., so we were up at 6 a.m. It was like waking up in the middle of the night, but since he was home so early, we had time to eat and go someplace before going to bed. After 12 days on that shift, he would change to another one, from 11 p.m. each night to 7 a.m. the next morning, then from 3 p.m. in the afternoon to 11 p.m. that night. It took awhile getting used to all that, but there was never getting into a rut. That day, I felt overwhelmed with fatigue, and probably jet lag, as I had been running on excitement and adrenalin the past couple of days. So I went back to bed after Oran left for work, but I was going to try not to get into that habit. There were going to be just too many things to see and do. Later that day Nona Tyler came over to bring us part of a cake she had baked and to visit. She told me more about the life over there, the people, and especially the Women’s functions. I felt close to her already as she looked so much like the sister of my best friend in high school. Also, her maiden name had been Henderson when she came to Arabia with her parents, then married Lou Tyler, a bachelor who worked for Aramco, as well. That was a frequent happening over there in those days. Anyway, I had been raised between the towns of Henderson and Tyler in East Texas, so thought it was a neat coincidence. The test of preparing my first meal was that evening, so I checked everything that had been supplied for us in my commissary closet, or pantry, refrigerator, or freezer. I selected beef fillets to broil, put them out to thaw, a rice recipe and a vegetable in a can. That, along with the cake Nona had brought ought to suffice. Oran was complimentary, said the meal was very good, but I thought the fillets were a bit dry. I vowed to ask my mother for some suggestions and her other more familiar recipes when I wrote, hoping the ingredients could be found there. There was no television in those days, so we decided to go to a movie that evening. Walking to the theater several blocks away would give me a chance to see a bit more of our camp, too. We left our apartment, 5-L-4, in the center of “Nejma”, walked toward the gulf, past a square block that was bare of houses, except for a brick building that was a bathroom facility for the Saudi Arabs and other non-senior staff camp workers, used mostly by gardeners and houseboys. There was also a plant nursery used for maintaining the yards and greenery in the family camp area. This was known as “Hammam Square”. Crossing Persian Boulevard we turned to the north on the sidewalk that paralleled the rows of houses closest to the beach, also known as, “King’s Row”. These were the oldest, more prestigious houses for the upper management employees and families. They had very pretty, well established, grassy yards, high hedges, large flowering plants and trees. Best of all, we could catch a glimpse of the gentle waves of the Persian Gulf as we passed entrances to the alleys and the sidewalks that continued past the 4 rows of houses to the smooth, sandy beach. Walking on three more blocks, at the intersection of Jasmine Lane, Persian Boulevard became a double wide square that separated the 7-unit apartment, N-i - E, and the school building on the west side from the 7-unit apartment, N-i-B, and the theater on the beach side, at the far north end of our camp. Beyond that were the perimeter fence, the desert sand, and a continuation of the beach and the Persian Gulf to the north. The theater was an impressive, large, modern, brick building facing north, as well, with an outdoor stage on the side toward the square. The movies, shown only at night, were of the “B” variety, heavily censored, but changed every couple of days. I don’t remember what we saw that night really, but I enjoyed it and knew we would put the theater to good use. After three and one-half days in Saudi Arabia, I started writing my first, long letter to my parents describing my trip over, our camp, and what life was going to be like over there. I knew they would be anxious to hear details, and I had plenty to tell them already. It was Friday, June 8, 1951, the Arab “Sunday” (they are all Muslims, so have a different schedule and type of worship in their mosques). Everything would be closed that day, so I wouldn’t be able to mail it, anyway, but have plenty of time to write on it. I wouldn’t try to attend our church service that day, although the company held a non-denominational service every week in the school building for the expatriate employees. If the minister, labeled a teacher on his passport, didn’t get up from Dhahran, one of the men who works for the company would lead the service. This was allowed by the King for our benefit. Oran came home from work before I got my letter finished, anyway. We had been invited to dinner to the home of some other friend’s of Oran’s, Natalie and Jim Fitzsimmons. She offered me help, as well, and loaned me some badly needed cooking utensils until my shipment arrived. Saturday started the regular work week for everybody except the shift workers. I had completed my long, 8 page letter to my parents by the time Oran got home from work about 3:30. So after resting and eating a bite, we caught the regularly scheduled, bright red bus that ran all through camp every 20 minutes to take us to and from “Nejma” to the shopping areas in the business section. There were also 4 taxis which could be called for convenience or speed, but most of the time everyone just rode the school-bus sized buses. There were bus stop signs and benches placed conveniently all around camp. We got off at the post office first to mail my letter and check our box for much anticipated mail from home. Then we walked the two-block distance to the commissary in that business area. The different buildings were placed so that you could easily walk from one to the other, or all of them, if you liked without having to ride the bus. Inside the commissary, I took more time that day to investigate and absorb everything, mentally planning what I would be faced with. A pleasant surprise was receiving two 3-lb. cartons of crisco, which the company had put back for new arrivals. Otherwise, the only thing available would be an unknown brand of vegetable shortening put up in pint ice cream cartons. I already knew they were out of potatoes and flour, but a sack of cake flour had been put in my supplies as a substitute. Oran introduced me to the commissary manager, Gene Hickman, and the staff, who were mostly Saudi Arabian men. 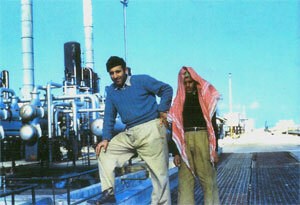 None of the Saudi Arabian women worked for the company. I would become well acquainted and associated with them over the next five and one-half years, as that was the only food store we had to shop in there, at that time. Some food items would be able to be found in a few small shops in Al-Khobar, but trips there would be few and far between. For the next several days I was truly on my own, occupied with learning to be a housewife in a strange new place. I was soon able to go all over camp without any trouble. It really wasn’t that big. Everyday I got together with the other bride I had come over on the plane with, Charlotte Phillips, who had been going through her own indoctrination process in this new country. We happily compared notes, and told each other what we had learned, seen, and done since our arrival. Cooking was important to Charlotte, too, and she was about in the same boat I was. So we checked our recipes, decided what to prepare for meals, and then caught the bus to the commissary together to try to find the necessary ingredients. It was such a pleasant surprise to find some things we needed, but, on more than one occasion, we had to figure out a substitute ingredient or toss a recipe all together. Although frustrating at times, it was good experience and great fun, if you can imagine. In the evenings we continued with our social activities, and the days seemed but a few hours long. Time was just flying by, for me, anyway. By the end of that week, we had been invited out to dinner two times and played canasta two times with different friends of Oran’s, who soon became mine. This seemed to be the favorite pastimes. I had met so many people and learned so many things about the place that I was beginning to feel like a vet already. I’d even picked up a few Arabic words and phrases, but still had to stop Oran every now and then to translate something he unconsciously said in our normal conversation. My first impression of liking it there had not changed, in the least, but had increased, if anything. The whole place was really intriguing, and I loved it even more. I don’t believe you could have found two happier people right then than Oran and I. There was all the difference in the world in both of us now that were together again and settled, at last, living in our own home. 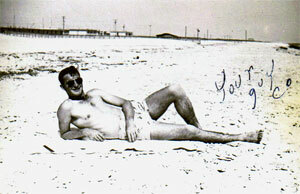 A lot seemed to happen on Thursday, June 14, 1951, the beginning of the second weekend I was in Saudi Arabia. One of my neighbors loaned me a copper bottom chicken fryer with a cover and some pie pans, so I decided to bake my first pie. I discovered I needed more than a pie pan, though, when I realized I had no measuring cup, so I guessed. Of course, we didn’t have flour, either, but I used the cake flour that had been given me as a substitute. I knew before I tasted that pie that it would have a tough crust, but to my surprise, and Oran’s delight, it was good. I had brought my mother’s banana cream pie filling recipe from home, so that was delicious, as usual. I would have to try a pecan pie next. That evening Oran & I went to the Persian Gulf to swim for the first time since my arrival, and it was every bit as nice as I expected. Breathtakingly beautiful, it was a couple of blocks from our apartment, but across Persian Boulevard, and past the 4 rows of houses to the beach. We walked across the smooth sand, past the wooden, open-slatted sand fences down the gradual, sloping, gentle edge into the water. As I said before, the water was a lovely, deep green color, with soothing, relaxing, quietly lapping waves caressing our bodies as we sank into it. Galveston couldn’t hold a candle to this. There was a large, square, barge-like raft anchored a little way off shore. 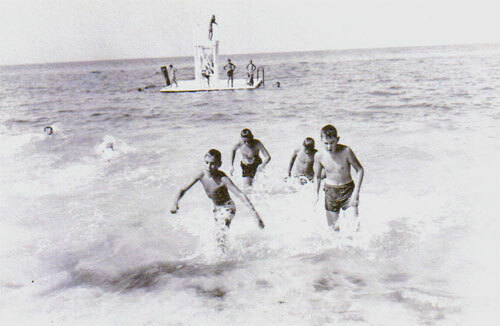 It had a ladder on its side, coming up out of the water, to climb onto it, and a high platform, on one side, for a lifeguard to sit watching over the swimmers. Oran had done that a couple of hours a day for children’s groups he taught to swim when he lived in Arabia alone. We swam out to the raft, rested awhile there before swimming back to the beach. We stretched out on the beach on our towels to dry off and admire the cloudless sky. The weather seemed perfect, as it had cooled off from the extreme heat of the day. It would be an excellent place to get a tan, which seemed to be the popular thing to do, so I would try. It seemed so strange to live so near the water. We could go to the beach most evenings, before supper, and work up an appetite. It was going to be much, much better than just visiting a seaside resort. Oran had to change work shifts that day, so went to work at 11 p.m. that night. It was nice for me since I went to bed as soon as he left, and when I woke up about 7:30 the next morning, he had just gotten home again. The bad part about this shift was that he slept all day, so I had to be quiet doing my house work. I usually went visiting or shopping so he could get plenty of uninterrupted rest. There was never any worry about being in the house alone at night. Besides there was a wonderful lock on both the front and back door, and very nice neighbor’s right next to me. I never felt safer than when I lived in Saudi Arabia. That day, June 15, 1951, I wrote another long letter to my parents. I had already started looking for mail in our post office box, so I wanted to keep the letters coming back to us. They helped so much over there in every way. I stopped about 4:30, though, to start preparing dinner, as Oran would be up soon. I’d had some more kitchen things loaned to me, so now I could do a little more along the cooking line. I wished I had filled out a notebook with Mother’s recipes before I left home. The cookbooks I brought called for so much stuff I knew wasn’t necessary, but I didn’t know what to leave out or add like Mother did. I had asked her to send me her cornbread, waffle, and pancake recipes, also anything else she might think of. I missed mostly just common, everyday food recipes. I did bake some more pies, three to that date. The first, as I mentioned, a banana cream was very good, the second, a pecan, had a wonderful crust, but the inside was burned, the third, another banana cream was very good, too. More about pies later, no doubt. Most all the young couples there were about our age and really swell. Most all of them either had a baby or were expecting one. It seemed to be very stylish. One couple we met, Pat & Bob Cundiff, were finishing their contract next November, and he planned to enter Tulsa University to use up the rest of his GI Bill. They had lived 40 miles apart in Oklahoma, but didn’t meet until she came to Arabia with her parents. One of the older women I met, Florence Goodale, took me under her wing, brought me flowers from her yard and loaned me a waffle iron and other kitchen utensils I needed badly. She took me to play Canasta Tuesday night and asked me to join their club. Oran & I played canasta with Nona & Lou Tyler the night before. The company gave a coffee for all the new “brides” on Thursday, the 21 st, and I met most everyone in camp. It wasn’t long before I had learned enough about cooking to invite one of the men Oran worked with, Art Zampolino, to dinner. I thought I would practice on him before having a couple over, so we picked Sunday, June 24. I’m happy to say everything turned out swell. Anything I fixed would probably be better than he got in the mess hail, anyway. We finally had received that food shipment from the United States the week before, and it had lettuce, tomatoes, celery, cabbage, and, best of all, potatoes, which we had been doing without until the ship came in. The lettuce and tomato salad I made was a real luxury to Art. He was from New Jersey, and I knew him already from Oran’s letters and pictures he had sent. Monday, June 25th, was Oran’s last night on 11p.m. to 7a.m. shift, and I couldn’t say I was sorry. After Oran went to work, I wrote more on the letter I had started to my folks and related all the latest activities. Then to bed, as I would have to get up early to cook breakfast for him the next morning before he went to sleep for the day. He could eat enough to keep a ten-ton truck going, but I wasn’t complaining. After a couple of days off, he started his 3 p.m. to 11 p.m. shift. During that shift, we had the Fourth of July Holidays. The company always has several different activities during that time. There was a ball game one night, and a carnival another night, which I went to with my neighbors, Lou & Nona Tyler, because Oran was working. The third night there was a semi-formal dance on the patio, and we attended that. That was the extent of our celebrating in this year, 1951. I did hear a few firecrackers going off every now & then in the night. My days seemed filled from beginning to end. I guess I was just getting too social. As well as playing canasta once a week, I filled in at a bridge club meeting on Saturday in the second week of July. 1 didn’t know the first thing about it, but didn’t do too bad. I hadn’t planned to learn to play bridge, but that did seem to be one of the main pass times and a way to meet everybody. And I had met a woman I would become very close to, Desda Hale. She & her husband, Bill, were about our age and had been married close to the same date we had. I also met Ann Gulovsen. She & her husband, Bob, had us to dinner, as well as for canasta and bridge. We would do a lot together, too. Of course, my housekeeping still took up considerable time. I tried to bake something every three or four days, and I had to wash at one of my friends houses since I had no machine then. My meal planning and cooking became easier, but I still had a lot to learn, and it all depended on what was available. I wrote to my mother on July 16th to tell her about that. We could get pecans every now and then, and just that day, from Lebanon, I got some carrots, plumbs, and pears. Last week, I got tomatoes and bananas. Eggs were cold storage and shipped over from Australia. When I arrived, they had both milk and whipping cream, but none a little later. Perhaps this would give her a small idea of what I had to work with in the line of food. Oran had been promoted to Senior Operator. This meant more responsibility for him in the Refinery, but also a nice raise in pay. And he was happier in his work with more to keep his mind occupied. I was very proud of him.